Germany eubiotics market will register 6.5% CAGR up to 2024 owing to rising importance of livestock health and antibiotics ban in the EU. North America led by the U.S., Canada and Mexico eubiotics market may witness gains at over 6.5% by the end of forecast timeframe. Shift in preference towards antibiotics substitutes and increasing meat consumption in the U.S. is likely to drive the industry growth. Moreover, increasing demand for healthy and safe cultivation of meat from poultry to produce good quality of meat may drive regional eubiotics market. Global Eubiotics Market is expected to exceed USD 4 billion by 2024; according to a new research report by Global Market Insights, Inc. Emerging livestock diseases caused by viruses, bacteria, toxins and parasites such as salmonella and listeria may lead to mortality rates, inefficient feed conversion, improper growth and lower immunity majorly among cattle, broilers, swine and aquaculture species. Increasing consumer preferences towards healthy meat and milk products along with strict regulations regarding antibiotics ban in Europe may stimulate eubiotics market growth. Prebiotics market from fructo-oligosaccharide is expected to register significant gains at over 10% by 2024. FOS are non-digestible fibers which supports the growth of probiotic bacteria in the GI tract and are widely used in dairy products, thereby stimulating industry growth. Dry form eubiotics was valued at over 1.5 billion in 2017 owing to its longer shelf life and improved culture stability. These products are used in animal feed owing to its low storage and transportation cost should fuel the industry growth. 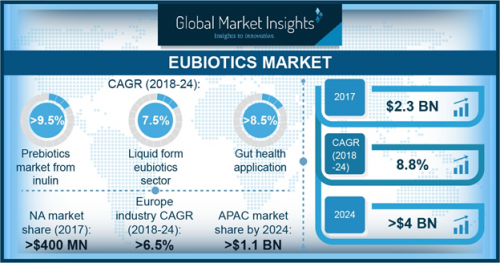 Eubiotics market from gut health application may register significant gains at over 7.5% by the end of forecast period. Gut infections may lead to low efficiency, low yield along with additional cost in treatments and trade losses which has resulted in necessity for these product to maintain gut integrity and functionality. U.S. eubiotics market will exceed USD 480 million by the end of predicted timeframe. Consumer preferences towards protein rich diets as compared to carbohydrates pertaining to maximum levels of obesity and overweight population in the country. Consumption of high quality of milk, dairy and meat products on account of high economic conditions, hectic lifestyle schedules, rising innovation in the meat processing industries and easy affordability may stimulate eubiotics market demand.